The real struggle of summertime for me? Figuring out how to get dressed for the super hot temps outside and the frigid arctic air inside. Seriously, who decided that 65 degrees is an appropriate temperature indoors? Since I'm not exactly in a position to change the temperatures in the businesses I frequent, instead I've just been carrying my (not so) new favorite blazer around with me everywhere to help balance things out. Linking up with Style Sessions and Stylish Tuesday. The wedge on these sandals is the perfect hight...you look so cute! I love the height of your shoes. It's just enough to add height but not look like it's anything outlandish. This is such a polished outfit! Great outfit! I'm always carrying around an extra layer, usually a cardigan because I can just drape it over my purse when I'm not wearing it. The difference between the heat outside and the chill inside can be pretty extreme! I've been doing the exact same thing. My blazer is the perfect piece to make an outfit warm enough and office appropriate enough. I love your necklace! The blazer and the shorts look great together! Very cute! Love the necklace! And yes my struggle is the same! How to deal with the humid commute but then get to the office and freeze, lol! You look so cute. Love your outfit and your shoes. I don't get cold very often, but if I ever do while I'm at work, I use it as an excuse to get up and take a quick walk around the block. The benefits are two fold: warm up and get a few extra steps in! i love the necklace and great shoes!! 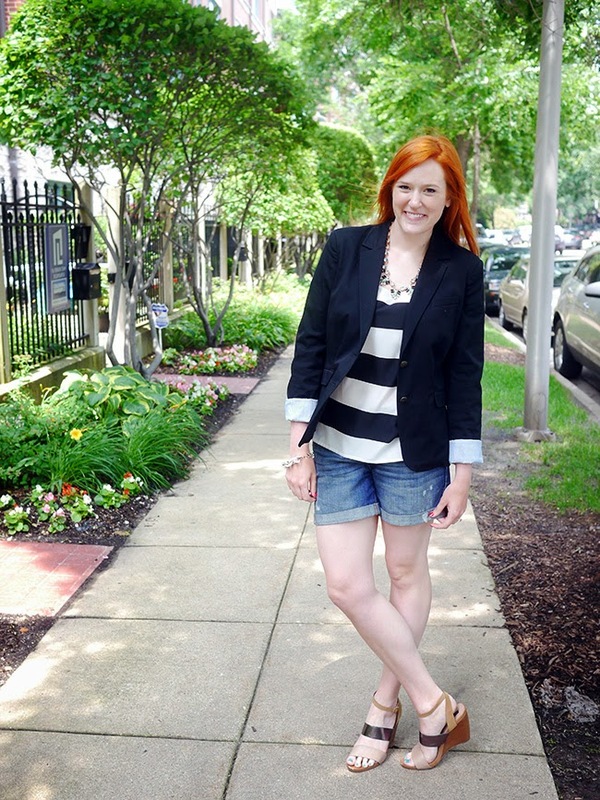 I love how you dressed up the denim shorts with a blazer & you definitely can't go wrong with black and white stripes!